I thought I’d take a few minutes to share our potty training routine because it worked so well for us. It all started when my son was around 18 months old. I ordered a potty and got the ball rolling. The first step was introducing the potty. We placed it next to our big potty in the bathroom. The very first day we had him sit on it and demonstrated what to do on it. We returned to the potty several times that day and everyday after that. He remained in diapers at all times, but we kept going to the potty to familiarize him with it. After about a week, we decided to go full blown, cold turkey, potty training. We brought the potty everywhere we went in the house. That wasn’t hard in a small apartment. We’d spend most of our time in the living room, playing, so the potty sat right next to us on the living room floor. At that point we took the diaper off and let our son run around the house naked all day, only putting a diaper on at night to sleep. That might not work for every situation. I didn’t mind having a naked toddler running around and I didn’t mind cleaning up the accidental pee spots on our hardwood floors. We tried our best to stay home that first week, but when we did make the trip out, I’d lug around the potty in the car. Still, my son would be diaper less. The key was to have him pee before leaving the house and then just keep asking throughout our outing. We were lucky enough to have mommy friends who didn’t mind having a little pee on their floors or poop in their yard. We also made sure to bring along A LOT of change of pants. For the first few weeks of cold turkey potty training you’ll probably end up spending what you saved on diapers on laundry and/or extra pants. I always made sure to have at least two changes of pants at every outing. My son has always had the tendency to tinkle a little before letting us know he had to go potty. A little or a lot, you still have to change their pants. Pee pee was the first step, but probably the hardest. Poo poo was pretty easy for us. My son makes a face when he has to poop, as I’m sure everyone’s child does. When I saw that face, I knew. Run. The first few potty training months were rough. I’d get peed on daily and we’d go through 3-4 changes of clothes, a crazy amount of potty runs and of course, frustration, but in the end it totally paid off. By the time he was around 22 months he was fully out of diapers and only wearing training pants on long trips or at night. By his second birthday he stopped wearing training pants at night. We had a few night accidents, but I soon realized those accidents only happened when he hadn’t peed within a few hours before bed or if he was sick. He made it a point each night to go potty before bed and we’ve been accident free for weeks. I could continue to put him in training pants to sleep, but I know 10-12 hours in plastic undergarments is just not comfortable. Also, I soon realized that my son wasn’t peeing in his sleep, but rather peeing as soon as he woke up in the mornings. The key was to wake up with him when he’d wake up, take the diaper off and place him on the potty. All those heavy, full of pee morning diapers were a thing of the past. My little boy is now going on 28 months and hasn’t seen a diaper in over 6 months. He tells us when he has to use the potty and can even go potty on his own now. It took time and dedication. A lot of patience and a lot of pee, but we got there. 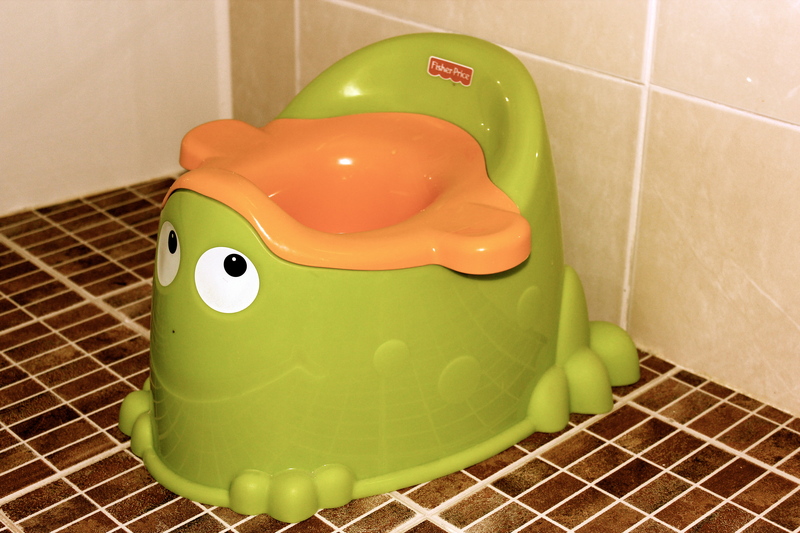 For us, it was important to potty train our son at an early age, but starting at 18 months is not for everyone. Don’t waste your money on reusable training underwear. We did and they were horrible. The plastic feeling was just so rough and crinkled when he wore them. The sides of the underwear seemed uncomfortable. After two days of wearing them, we gave up. Don’t bother with potty training books. Maybe at an older age a potty training book would have had more of an impact, but for us, we didn’t need to read about it, we just needed to do it. Don’t bribe your child with candy. A child will have to pee or poop whether you hand them candy after every time or not. Personally, it’s just starting a bad habit and there are a lot better things to keep the candy bribery for. Do buy something to protect your car seat from those little accidents. Trust me. Accidents will happen and it’s better to have a cover protecting your little one’s car seat, than having to clean it every time it happens. Don’t be afraid of pee. After a while we stopped bringing the potty in the car for long outings. Why? Because we discovered our little boy was a little boy and could very well pee in an empty bottle or cup when a potty wasn’t near. And bushes, bushes are a potty training little boy’s friend, pee in them, poop in them, when nature calls, run to them! The most important thing when embarking on a potty training journey, cold turkey or not, is to not give up on your little one because of a rough day. Giving up just means having to start again from scratch later on. Do spend the time. Have the patience and understanding required. And don’t start unless you know you’re ready to make that commitment too.